Audio gating confusion needs to stop. Gating is a simple process which, when used at the right time, produces great results. Audio gating is the control of when and to what degree audio passes through a channel. It’s based on factors including the signal level strength. In some cases, it’s referred to as a noise gate. Imagine standing in front of a fence gate and whispering, “I want to come in.” Nothing happens. Then you yell, “I WANT TO COME IN” and this time the gate opens. The higher volume level is what opened the gate. The speed of the opening and closing. The time the gate stays open. How soon the gate can be fully opened again. Using these properties, a number of audio gating techniques can be used. There are three main reasons for gating. The stage is full of sound, from the instruments and singers to the wash of floor monitors and slapback. An open microphone should pick up the intended source and very little else. For example, look at a vocal microphone. The microphone should capture the singer’s voice but it should not reproduce the stage sounds into the house mix. Use of a gate would stop those lower signal level stage noises from being broadcast when the singer wasn’t singing. Gating can be used for clearing up a signal. Consider an electric guitar signal which sends hum along the line. This is sound coming from the intended instrument but it’s not a useful sound. In this case, noise gating could be used to keep out the hum when the musician wasn’t playing. Knowing how to use a noise gate will definitely improve the house mix by reducing the extra buzz from electric guitars and amplifiers. Another way to use gating as an effect is by adding punch. For example, imagine the sound of a kick drum being struck. It takes fractions of a second for the volume to build. By altering the speed in which the gate opens and the signal strength required to open it, you can give it a punchier sound by only opening the gate once the initial sound level is much higher. Where is the gating control? Rack unit. Units like the dbx 1074 QuadGate and the Behringer MULTIGATE PRO XR4400 are rack-mounted gating processors used in conjunction with the console. Some compressors, like the dbx 166xs, include limited gating controls. Physical console control. Some digital consoles have dedicated gate controls on the console such as with the Midas M32 and the Presonus StudioLive. Integrated into the console. Consoles like the DiGiCo SD9 and the Yamaha CL-series allow for gating through the software display and encoder integration. Touch the screen or touch the assigned knob to adjust. Touch-control software. Remote-controlled mixers now place everything into smart-device controls like iPads. Gates are controlled through setting five parameters; threshold, attack, release, range, and hold. There is one exception; some multi-function rack units such as “compressor/gates” only allow for control of the threshold and maybe one other parameter where all other parameters are fixed. This shows the speed in which the sound is processed once it reaches the threshold, then the gate is opened, it’s held open after dropping below the threshold, and then the gate is closed during the release time. Threshold, as engineer Beau Brown puts it is, “the key to the gate.” It’s the decibel level in which the gate opens or closes. The higher the threshold, the louder the sound (stronger the signal) must be to open the gate. The lower the threshold, the more sound that will pass through when the gate is open. The trick is finding the right spot to open the gate which accounts for player or vocal volume nuances. To put it in practical terms, musicians don’t always play or sing at the same level they did during practice. For this reason, it’s helpful to find that ideal threshold and then back it off a few decibels to account for these changes. Audio gating, which seems like an on-or-off control, creates a better sound when the speed of the opening and closing varies based on the need. The sound of a drum being struck and the sound of a singer are both sounds that have a natural decay. To close those channels the moment their signal level drops below too high of a point would be like suddenly muting their channel. 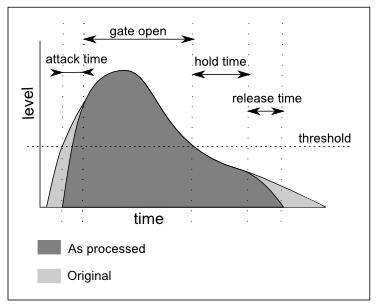 The attack time controls the speed of the gate opening. The time is in microseconds, under one second. A gate that opens too quickly on a slower signal attack can produce a click sound. The simple solution is to extend the attack time until the click sound disappears. Consider very fast attack times for percussive instruments and slower times (10 ms or more) for everything else. The release (decay) time is key to a natural sounding audio decay. It’s measured in microseconds to seconds. Setting this time has much to do with how the gate is being used – noise elimination or effect. For noise elimination from a line, such as with an electric guitar, you want a natural decay which ends with the line noise being cut out. If using it as an effect then it would be set much faster. The range is the amount of decibel reduction to the signal once it’s gated. Fully engaged, think of it as an iron gate – nothing is getting through. An iron gate isn’t necessarily a good thing. The range can be set to a lesser decibel cut, such as -15dB. This means with the gate closed, some of the sound can be heard, though to a lesser extent. A gate set to the maximum range creates a dead sounding instrument. In the case of a snare drum and a few incorrect settings, the natural decay of the snare wouldn’t be heard. By setting a small range, the decay would come through though the degree and time it lasted could still be controlled. You might think of it as a controlled fade. A benefit of using a smaller range is it decreases the processor’s time to open the gate. For example, a -90 dB change to the threshold takes longer than a -15 dB change because the attack time indicates the rate at which the gain changes. It would be like driving zero-to-60 MPH versus 45-to-60 MPH. The hold time is the minimum time the gate is held open. The hold time can be controlled though often internally set to a minimum of 20-30 milliseconds to prevent chatter. Chatter is the constant opening and closing of a gate due to a high-speed fluctuating signal level. Another type of chatter-control is called hysteresis. In this case, the threshold automatically increases for subsequent gate openings and decreases a few decibels for closing the gate. The idea is a sound of fast varying levels would not produce chattering. 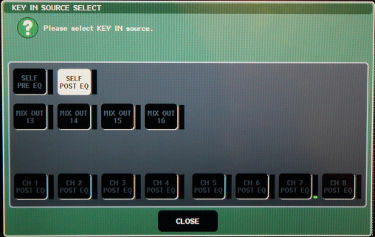 Side-chain settings in the M7CL. Warning: Incorrect gating wreaks havoc on your mix! There are side effects and problems associated with using the automated process of gating. Although this was discussed within the “hold” section above, it’s possible that poor gating settings still allow chatter to occur. Put on headphones, hit the PFL button for the channel, and listen to the results of the gating. 2. Loss of desired sound. Musicians can play or singer with volume dynamics. Softer here, louder there, this is part of song arrangement. However, a gate might close when that happens. Back off the threshold if this is happening. By gating, there is the possibility of shortening the decay rate of a sound. Imagine placing a tight gate on a piano so the notes end abruptly instead of naturally ring out. Gating doesn’t need to be used on everything. But when it is used, listen to the results in headphones to check it and alter settings appropriately. There is intentional distortion, like that used with an electric guitar or used as an effect on an input. There is also bad distortion and one way that can occur is as a result of gating. Imagine a gate setting on a snare where the gate is opened and then a slow release is applied to capture the full decay. However, if the snare is played again during the release portion, the gate won’t open until the end of the release time and therefore would not open until after the snare is initially struck. You’d only hear a partial snare sound after the snare was hit. Repeat this over and over and it produces a distorted sound. Let’s turn to a drum kit for audio gating techniques. 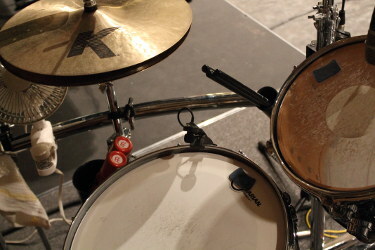 Know that the best method of capturing a drum kit is using the right microphones. This minimizes the amount of extra work just to get “a good sound.” For example, the snare microphone should be cardioid so it doesn’t pick up the hi-hat. Even with the right microphones, there’s sound bouncing around that will enter the microphones. Add in a drum shield or full enclosure and it’s even worse. Enter gating. This image shows our snare miked with an Audix MicroD and obviously the hi-hat and other cymbals are right there. The sound of those fixtures will get into that snare. I use a moderate amount of gating on the snare mic so when the drummer isn’t playing the snare, the hi-hat and cymbals don’t blast through. But I do have to establish a balance between gating out the cymbals and allowing the snare to be heard, which isn’t always easy due to the proximity of the instruments to the microphone and the volume in which they are played. 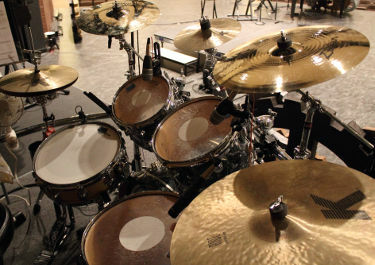 Drums can be captured with only a few microphones or individual kit piece microphones. I’ve used both and each style has its benefits and its shortcomings. My personal preference is for individual miking so I can have the most control. Imagine that, a sound guy with control issues! Look at the tom mic placement in this photo and the distance to the cymbals. Gating seems like a good idea but what about that cymbal volume opening the gate? Some gates have additional frequency parameters so the gate only reacts to frequencies within a specified band. The frequency parameter on the tom could be set with a rolloff of the highs. Therefore, the gate is actively ignoring the high frequency cymbals and only opens based on the mid-range and lows of the tom. It’s a gate-specific EQ that affects the gate but not the sound itself. Some gates work with a centering EQ so the user sets it to focus on the frequency area of the primary instrument. Test out the results of your gating by listening to the soloed channel via headphones. Don’t use it just because it’s available. There must be a reason and it has to benefit the mix. I don’t use gating on keyboards or acoustic guitars. In both cases, I’m getting clear signals and haven’t had reason to use it as an effect. Carefully consider gating on vocalists who have a huge dynamic range for a song. Their wide volume changes can drive you nuts if gating. Don’t use gating because you used it last time. Every live scenario is different. I’ve had times when I used drum gates during a mid-week practice and turned them off come service time because the drummer played much lighter. Don’t use gating when EQ work is a better choice. Or use both. It depends. For example, use a high pass filter to roll off the low end of a tenor vocal and use a gate to keep out stage noise. Though I’d be more likely to only use the HPF. If this is vague, then I’ve done my job – YOU have to listen to the sounds in YOUR room coming from YOUR band to determine what’s needed. The number one audio gating tip! 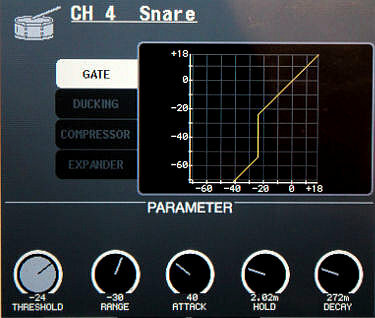 Gating is one of many mixing controls and while it doesn’t always need to be used, it’s nice to know it’s available. Whether you use it as a noise gate or a sound sculpter, know it’s more than a one-trick pony.